Brazil draw for only the second time in test history after sharing 40 points with Chile, while Uruguay are favourites to become South American A champions after a big win over Paraguay. Uruguay are in total control of the South American A Championship after making it two wins from two to top the table with six points, while Chile, who could only draw with Brazil, are in second spot with four. Uruguay were made to work harder for victory against Paraguay in Asunción than the final scoreline of 60-15 suggests. Paraguay produced a good first half performance in front of a sizeable home crowd at the Héroes de Curupaytí rugby stadium to trail by just five points at the break. Los Yakarés then scored the first try of the second half through Gonzalo Bareiro to draw level at 15-15, but Los Teros managed to find another gear and posted 40 unanswered points in the final 35 minutes, flanker Gonzalo Campomar capping a man-of-the-match performance with a hat-trick. After an early exchange of penalties by kickers Sergio Alvarenga and Martín Secco, Campomar crossed for the first of his three tries on 18 minutes. Soon after Paraguay replied through second-row Carlos Plate but Campomar found his way over the try line for a second time on the stroke of half-time. With Secco converting Uruguay held a 15-10 lead at the break. Two minutes into the second half, home scrum-half Bareiro got Paraguay on level terms with a well-taken try. Unfortunately for Paraguay, that was as good as it got as Uruguay’s superior strength and fitness began to tell. Los Teros ran in seven more tries, two of them going to wing Mauro Daverio. Campomar completed his hat-trick, after centre Nicolás Freitas scored, while there were also tries for number eight and captain Alejandro Nietto, second-row Fernando Bascou and Germán Kessler. Secco converted six of Los Teros’ nine tries to add to his earlier penalty for a 15-point haul on the day. Brazil took another step forward by drawing 20-20 with the higher-ranked Chile in front of another enthusiastic crowd in Sao Paulo. It was the first time that a test match featuring Brazil had ended all-square since they shared the spoils with same opposition in 1964. Os Tupis could have been celebrating a repeat of their solitary victory over Los Condores in 2014, after outscoring the visitors three tries to two; however, their normally reliable kicker Moisés Duque had an off day with the boot. By contrast, Chile centre Matías Nordenflycht enjoyed a fine game from the kicking tee and contributed half of his side’s points. Nordenflycht’s first points came from a difficult conversion after Chile had opened the scoring with a in the corner for winger José Ignacio Larenas. Trying to play good, positive rugby, Os Tupís began the second quarter with a five-pointer for Guilherme Coghetto, which went unconverted. Soon after, Nordenflycht kicked a penalty to stretch Chile’s lead to 10-5 at half-time. 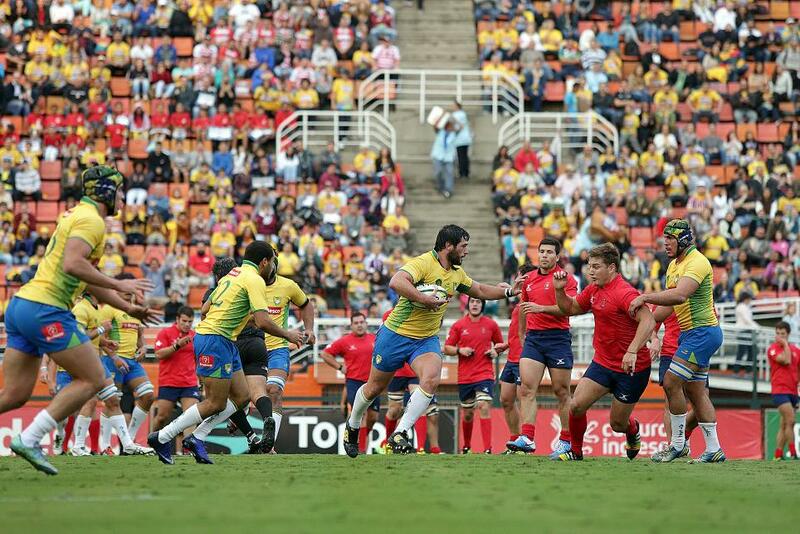 Brazil came out for the second half ready to take the game on and bearded second-row Diego López barged through for a try under the posts which Moisés Duque converted to put his side 12-10 up. Their third try came a couple of minutes later with replacement Stefano Giantorno finishing off the best move of the match, much to the delight of the crowd. The home fans were silenced however when flanker Cristóbal Niedmann’s broke off the back of a dominant scrum to close the gap to two points. Nordenflycht added the conversion and then a penalty goal but Duque levelled the scores with his only successful penalty attempt eight minutes from time. Both defences held firm thereafter and the game ended with only the second draw in 24 tests between the nations. Combined with Poland’s defeat to the Netherlands, a gain of just over a quarter of a ranking point was enough to lift Brazil up one place to 36th in the World Rugby Rankings. Chile fall below Kenya to 28th place. Next weekend, unbeaten Uruguay host defending champions Chile in Montevideo, knowing that a win or a draw will see them claim the South American A Championship title. Three points are awarded for a win and one for a draw in this competition. In the other game, third-placed Brazil travel to Paraguay. If Brazil win and Chile lose, Os Tupis will finish in second place and qualify for next year’s Sudamérica Cup, alongside Uruguay.